New findings from NASA’s Curiosity Rover provide evidence that significant amounts of oxygen once permeated the atmosphere of ancient Mars. The Red Planet, it would seem, was more Earth-like than we thought. Using the ChemCam instrument atop Curiosity, scientists at the Los Alamos National Laboratory have discovered high levels of manganese oxides in Martian rocks. 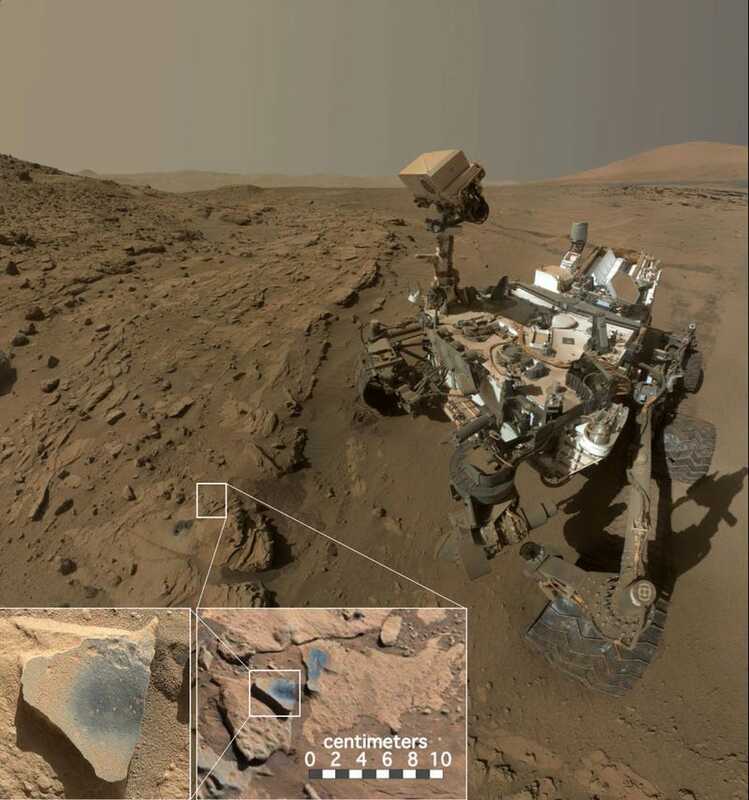 The rover made the discovery in mineral-filled cracks in sandstones in the Kimberley region of Gale crater. The presence of this chemical element suggests that high levels of free-floating oxygen once existed on Mars, and that in addition to having a warmer climate and lakes of liquid water, this planet was once quite Earth-like in terms of its chemical composition. It’s highly unlikely that microbes produced Mars’ manganese, but the suggestion that they were produced by free-floating oxygen is wholly reasonable. The researchers say that high-manganese materials like the ones discovered on Mars aren’t capable of forming without copious amounts of liquid water and oxygen. But where did all this oxygen come from, and where did it all go? Lanza’s team hypothesises that oxygen seeped out of the planet’s water and into the Martian atmosphere as Mars’ magnetic field collapsed. Without a magnetic field to protect the surface from ionising radiation, the molecules within the water split into hydrogen and oxygen. Due to the relatively low gravity on Mars, the planet couldn’t hold on to the lighter hydrogen atoms, but the heavier oxygen atoms stayed put. Over time, this oxygen bled into the rocks, creating the rusty red dust that now covers its surface. Tellingly, it doesn’t take much oxygen to create the red iron oxides—but it does take a lot of oxygen to form manganese oxides. This means that Mars, for a time, was quite oxygen-rich. And that’s an exciting result. Mars may have been habitable a billion years ago or so, so it may have spawned basic microbial life (we have yet to find any proof of this, but we’re still looking). Oxygen, which is necessary to sustain most terrestrial life, is used in cellular respiration and other biological processes. Many important classes of organic molecules in living organisms contain oxygen, including proteins, nucleic acids, carbohydrates, and fats. It’s possible that exotic alien life might emerge without the benefit of oxygen, but here on Earth it’s been critical.